I surveyed the smart and tidy speedboat with its bright yellow canopy. I gazed at the inviting and sparkling river. It was a beautiful, sunny day filled with promise. My surprise father’s day gift to my husband of renting a boat had been received well. I dismissed my son’s fear. “Don’t worry, Jack. It will be fun. The boat will not sink, and even if it did, you are wearing a life jacket and there are plenty of other boats on the river to ask for help if we have a problem.” I perfunctorily lifted him into the boat while the boat rental guy provided brief instruction to my husband and teenage son, Chase. My youngest daughter Grace studied Jack’s consternated face and her expression became pinched and wary. “It’s okay, Grace.” I deposited her beside her brother. I followed afterwards awkwardly, as I am not a seafaring gal. My teenage daughter settled herself into a seat and lounged comfortably while perusing her smartphone. The boat rental guy completed his information spiel and exited. My husband positioned himself behind the wheel with Chase close behind. We were underway. The first order of business was to take a few pictures to commemorate the occasion. My second priority was to snap open a Coke and begin passing out snacks. I adore wind and one of my favorite things in my few boating experiences has been the brisk wind that speedboats create. I commented that we were not experiencing much wind. Chase mentioned that the boat seemed sluggish and my husband added that the speedometer didn’t seem to be functioning properly. We dismissed these observations and continued on our way. About an hour into our journey, Chase pointed out that the motor was too low in the water. My husband put the boat in neutral and the two them peered over the back and discussed the situation. Shortly thereafter, water began seeping into the backend of the boat. Grace exclaimed that our flipflops would float away and went to rescue them. She brought them to the front of the boat and placed them next to Jack who was observing the situation with mounting concern. Two passing boats asked us if we needed assistance. We told them that we believed we were okay. We decided that it was prudent to call the boat shop. They told us not to worry because the bilge pump was automatic and would take care of any excess water. The bilge pump did not appear to be functioning. The storage compartment began filling with water. We moved all of our items and ourselves to the front of the boat. My husband manned the wheel and Chase bailed. We called the boat shop again and they still did not seem overly concerned. Jack began to cry and Grace cuddled closer to me. Water continued to creep into our craft. Again my husband stopped the boat and called the shop to tell them that we required assistance. He was told to restart the engine. At this point the engine would not engage as it was underwater and now oil became included in the mix. A compartment in the middle of the boat opened exposing buoys and more water where it should not be. It was then that it occurred to me that we were really sinking. One of the boats that had previously offered assistance came back and we gratefully abandoned our ship. Chase and my husband stayed behind to continue to bail and await the arrival of the shop’s assistance. We hovered nearby safely in the kind family’s boat until help arrived. Chase and my husband then joined us. A dolphin circled the smart and tidy speedboat as the river swallowed it. This is a true story although I have changed the names. My family has sustained no injuries, but currently the boat company is insisting that we are liable for the cost of the boat. The inspection showed no hull damage of any kind. They cannot tell us what caused the boat to take on water and sink, but they insist that it is our responsibility. We did nothing to incur any damage to the boat. Apparently, we are going to have to obtain legal assistance to try to prevent being responsible for the cost of a $64,000 boat. Any advice would be greatly appreciated! Thank God you’re all OK! Hope you can get some good advice; It can’t be right that you are responsible for the boat. Guess you better listen to ‘Chase’ next time! That is so terrible about your boat experience, glad everyone is safe. Hopefully you will find some good legal help. Hugs! Thanks Connie. Hugs right back! I am so glad you are all safe and sound. If the boat was sluggish it sounds like you may have started out with water to begin with. Did anyone check the drain plug on the bottom of the boat? If it had not been properly closed the boat would have been filling up with water while you were out. That happened to us once. We put my friend’s boat in the water and all of the sudden he started yelling about the drain plug (I’m not actually sure I have the right name for it) on the bottom of the boat. It started to take on water and he started diving under the boat to pop the thing properly back into place. Thankfully we did not sink a boat on the launching pad that day. But it sounds similar to what was going on with your boat. I don’t see how you could have been responsible and I think it’s terrible that they would hold you liable when there is not viable physical damage. I hope you can beat this. counter sue for endangering you and your family noting that you called the company several times during which they probably could have saved the boat had they acted accordingly and that failure to do so put your family at great risk. 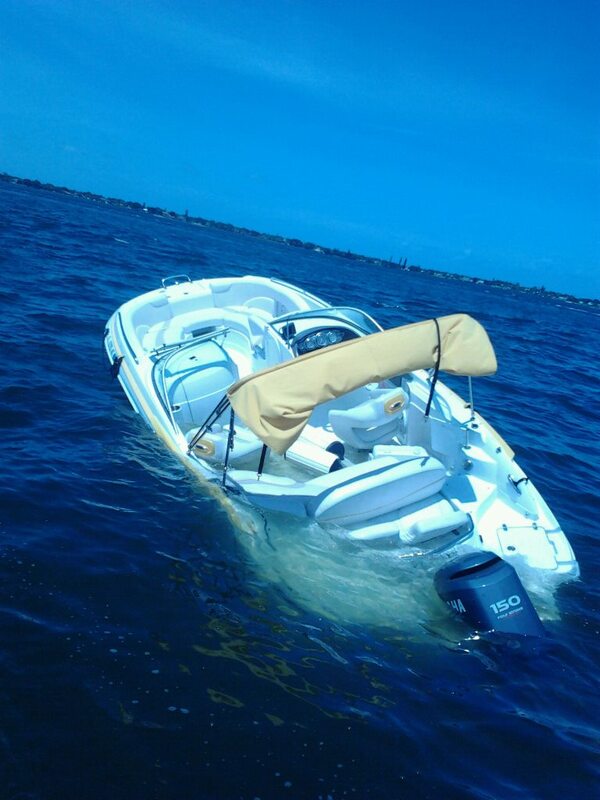 the fact that the boat was undamaged shows that you did nothing to the boat that would cause it to sink. also, i believe they should have offered insurance for any accidents that might occur. The boat obviously took on water as a result of negligence on their part and I think a sizeable counter suit might make them think twice. Also, have an independant Marine Survey done on the boat to see if the hull is sound and what could have caused the boat to take on water. dont rely on what they say. A qualified marine specialist will be able to tell exactly what happened and what damage may have been ‘added’ later if you catch my drift. As a forensic investigator i can tell you its worth doing. Wow! What a story. I’m glad everyone is Ok. I agree with Richard. If you did nothing to damage the hull, ie run over a tree stump, etc. then you have no responsibility to pay for their boat. The onus should be on the lessor to prove damages. They also have the legal responsibility to provide you with a safe properly functioning product in this case a boat. Also, the lessor has the responsibility to the lessee ( you ) to make sure that you know how to properly operate this particular boat. They should be paying you damages for putting you and your family in a potentially dangerous situation and for mental anguish. You should take the offense as opposed to the defensive. They probably have insurance on the boat anyway. If they don’t have insurance that may be illegal as well. It is in Texas and might be in Florida as well. Be proactive and I promise you this situation will go away quickly . Best of luck. If I can be of any help let me know. Good to know nobody got hurt, what an ordeal yipes! Thank you for your concern Andy! Thank God! you and family are safe. The boat matter will be handled and work out well for you..good luck! Glad you and your family are safe. Jack’s prediction was amazing. So sorry it came true. I consulted a friend who is familiar with boats. He said the two most common reasons that would cause such a scenario are the drain plug was missing or the billows were cracked. Many people remove the drain plug when the boat is taken out of the water. The billows is a black, accordion looking piece of rubber located between the outdrive and the back of the boat. You called for help repeatedly while bailing water out of the boat and no one sent help? Your family could have drowned due to their negligence! I find it hard to believe any reasonable court would throw the owners of the boat a life preserver! Best of luck. Wish I could be of more help. Thank you Judy 🙂 Your advice is helpful. I knew nothing about all of this sort of stuff before this mishap. Live and learn and learn what others are willing to share! Wow, an amazing story, Kellianne. Though I’m far from an attorney, I think you might want to hire an attorney who is qualified to represent you on both the defense suit and on a HUGE liability suit that you would bring against the boat rental company. Your family was in serious danger and I believe the large lawsuit would put the rental company’s claims easily to rest. Be prepared, however, to either pay your attorney pretty well or be forced to go through the entire process so that your attorney can get paid. Of course, there are no guarantees so legal fees will become another factor to consider. I, personally, would never agree to any payment of any kind. ‘Really hope it all works out. Hi Kellianne Sorry to hear of your news, but pleased to hear your all ok. Not a pleasant experience for you all. I don’t see how they can hold you responsible when it clearly is not your fault, the boat obviously wasn’t fit for purpose. Would you be able to have an independent marine specialist or someone likewise to have a look at the boat and assess the condition of it? Surely this will prove that you did not damage the boat. Please let us know how you get on with the case. Thinking of you. Girl, you always have a story to tell! I’m so glad you guys are okay!! !